The Fife Crazy Horse Dealer Safety Boot features a Steel toe-cap to EN20345 (200 Joules) as well as Steel midsole for underfoot protection. 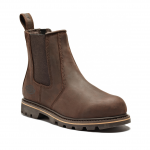 The Goodyear Welted Construction makes these extremely durable. With the breathable cambrelle lining, your feet will feel comfortable whatever the weather and the high density foam insock will keep walking on whatever surface comfortable. Like this Dickies Fife Crazy Horse Dealer Safety Boot? Why not click here to browse our wider range of safety boots?